"3LA1, V-2007" by Timothy K. Perttula and Robert Z. Selden Jr. CONTEXT INFORMATION: From a grave (Burial 1) in Burial Plot 3 (Martin 1939). Associated with V-2008 to V-2013. DECORATION: The upper rim panel is plain, while the lower rim panel is delimited by upper and lower horizontal engraved lines. The lower rim panel has four appliqued nodes, in sets of two on opposing sides of the vessel and just above the vessel carination. There are a series of engraved pendant triangles on the upper part of the lower panel, one of which separates the sets of two appliqued nodes, as well as engraved semi-circles. Belcher Engraved, var. 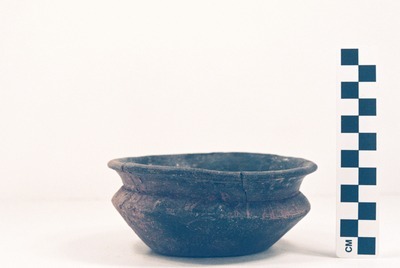 Belcher carinated bowl (5425-732) from the Battle site.